Hiking is a great way to relax, connect with nature, and enjoy time with your family. Bringing your kids along can be rewarding for you and for them, but it can also add new challenges and concerns to your trip. Get Your Kids Hiking is loaded with everything you need to know to hit the trail with kids; from gear to simple proven techniques that will make your hike safe and fun. 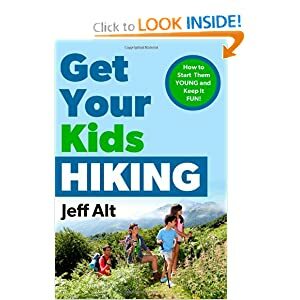 Written with both the novice and the seasoned hiker in mind, Jeff Alt provides all the information you need to take your child out on the trail. Get Your Kids Hiking is the playbook to inspire an appreciation for the great outdoors in your children and keep your young child or teenager interested in a family hiking trip. In addition to walking the 2,160-mile Appalachian Trail, Jeff Alt has walked the 218-mile John Muir Trail with his wife, and trekked across a 50-mile path of Ireland with his wife, young daughter, and extended family. I had the pleasure of reading the author's other book A Walk for Sunshine, and thoroughly enjoyed the experience, as the author truly had a harrowing experience on his journey. You also could tell in that book how much he loved hiking. This book takes all the accumulated knowledge that the author has collected over the years and places in an easy to read book that helps any hiker, from novice to expert. The author goes through anything and everything that you could think of asking and provides even more. I loved the checklists that are in the back of the book as it helps you get your mind around what you need to be remembering and packing for a hike based on the ages of your children (which is an awesome resource). The book also covers things from food to safety and the equipment you will need based on the age of your child. If you have ever wanted to start hiking with your children this book will definitely prepare you to start making the right decisions and make you even more confident!